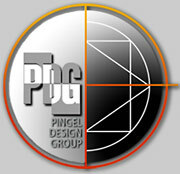 PDG–Pingel Design Group is a multi-disciplinary industrial design and engineering firm with a 21st century approach to new product/service innovation. PDG's design strategy is drawn from the Bauhaus concept of design and production; an institution for training skilled craftspeople by working collaboratively with industry developing prototypes suitable for mass production. PDG has added to this collaborative base by developing “Technical Integrated Management” (TIM) which brings together other disciplines to create a total solution – Design, Engineering,Building, Processing, Material Sciences, Systems, Production, Environmental Manufacturing, Marketing, Finance. PDG emphasizes less air pollution, reduction in waste stream, longer lasting products and more efficient energy usage. All at pricing that is competitive. Innovative Approach – Helps save the environment, one product at a time. PDG uses Technical Integration Management, a method which continuously reduces costs using all business disciplines. The integrated method helped develop PDG’s eco-friendly laminating process by reducing waste, lowering emissions with the end results lowering cost. The process also helped in our mold design, lowering capital costs.